Heating Controls are so important. The importance of having the ability to control your heating precisely cannot be overstated. So many heaters have inefficient or non existent thermostat and timing controls. There is no point having a super efficient heater if you have no means of controlling it. All our heaters come with top of the range thermostatic controls. These can range from a simple knob on the side of the heater to a wireless thermostat and timing control which even gives you the option of controlling your heating via an app on your smart phone from anywhere in the world. 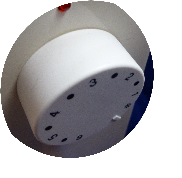 We have found over the years the majority of people prefer the simple control, used in conjunction with a simple plug in wall timer. To find out more details on each control type click on the appropriate picture opposite. Next:- Uses - What do you need a heater for? 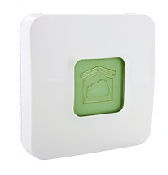 This connects wirelessly to the thermostat which controls timing and temperature.. It has various settings enabling complete control of your heating. 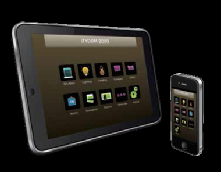 This can also be connected to the Internet for control of your heating from anywhere in the world via a app on your smart phone. Connection is via your home router which is connected to the Tydom 1.0 unit shown below. Prices exclude any delivery costs. This is our most popular thermostat arrangement by far. 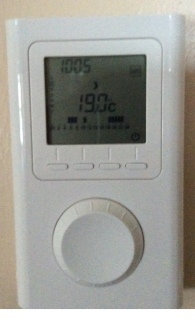 The thermostat (left) is simple to operate. When the red light is on the heater is using electricity when its off it isn't! 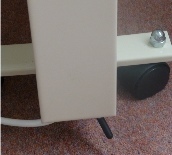 The black nib protruding down from the bottom of the radiator is the sensor for the thermostat. This is where the temperature is measured. It is the optimum point in the room to measure the room temperature. 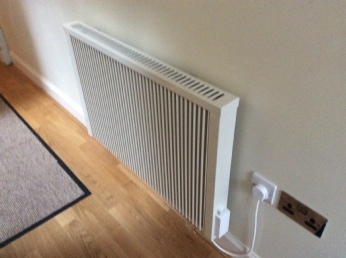 The coldest air is attracted to the radiator by the warm air rising through the body of the radiator.